Bok choy is a member of the cabbage family and often referred to as “Chinese cabbage”. Although it bears little resemblance to cabbage, it has powerful nutritional benefits that members of the brassica family deliver. 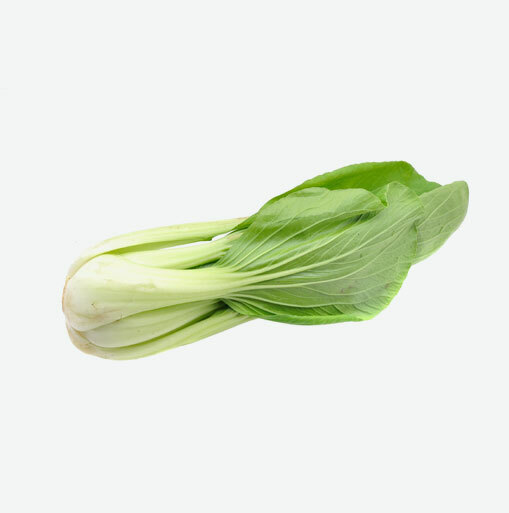 Bok choy has white stalks that resemble celery without the stringiness, and has dark green, crinkly leaves which is similar to romaine lettuce or spinach. The Chinese commonly refer to bok choy as pak choi or “white vegetable.” Another common name is white cabbage. Bok choy was cultivated in China since ancient times and became popular in Europe as early as the 1800’s. Today this nutritious vegetable is used in many kitchens around the world. Bok choy is very low in saturated fat and cholesterol. It is a good source of dietary fiber, and a very good source of vitamins A, B6, C, and K, calcium, folate and manganese. Bok choy delivers Calcium and vitamin K which are important nutrients for healthy bones. Vitamin C, and B6 are important vitamins for a healthy nervous system. Choosing bok choy is easy. Look for deep green leaves with white stalks that are crisp and fresh. Avoid wilted or slimy leaves. Store bok choy wrapped in a damp towel or place it in a plastic bag in the crisper drawer of the refrigerator. Store for up to three days. Make sure that the bok choy is well wrapped and protected while in the refrigerator or the leaves will wilt if this veggie is allowed to dry out. Preparing and serving bok choy is easy. Simply wash this veggie well in cold water and slice and chop it. For stir-fry, separate leaves from the thick white stems and chop both into 2-inch-wide diagonal chunks. The stem pieces should be added to the stir-fry several minutes before the leaves, as they need a longer cooking time. Bok choy can compliment a stir-fry with any combination of vegetables you like (such as carrots, broccoli, yellow onions, garlic, ginger and scallions), or it can be the stir-fry. Saute onions until they begin to soften. Add the bok choy stems, tofu chunks, soy sauce and grated fresh ginger root. Add the bok choy leaves last. Serves with rice or noodles. Steam bok choy like other leafy greens, starting with the stems cooking first. Toss with a favourite marinade or salad dressing. Try an Asian flavour by tossing steamed bok choy with a light coating of toasted sesame oil, soy sauce and rice vinegar. You can enjoy bok choy in soups and stir-fries, appetizers and main dishes, either raw or cooked. Do not discard the stems! bok choy has a light, sweet flavour and a crisp texture.